Mg Two in One Shampoo is perfect for all hair types. 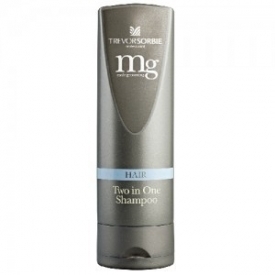 This must have men’s shampoo cleans and conditions hair in one time saving step, leaving it ready for styling. - Contains anti-oxidant Ginseng extract and a UV absorber. Ginseng Extract – an anti-oxidant that contains nutrients to help prevent damage to hair and protect against environmental stresses. Ethylhexyl methoxycinnamate – a UV absorber to give protection against damaging UV rays which can make hair dry and brittle and fade hair colour. Gylcerin – an ingredient to attract moisture to the hair. Polyquaternium –10 – a polymer that gives condition to the hair by smoothing the cuticles. Quaternium 80 - a conditioning agent improves the feel and shine of the hair. I bought this for my partner as part of a set and it has amazing results. Hair is absolutely clean and actually squeaks. I think it has a no build up formula so stops the clogging and dragging down of the hair, leaving it care free and soft. One of the best male shampoo's around!